Found this interesting poster by Public Transport of Victoria. 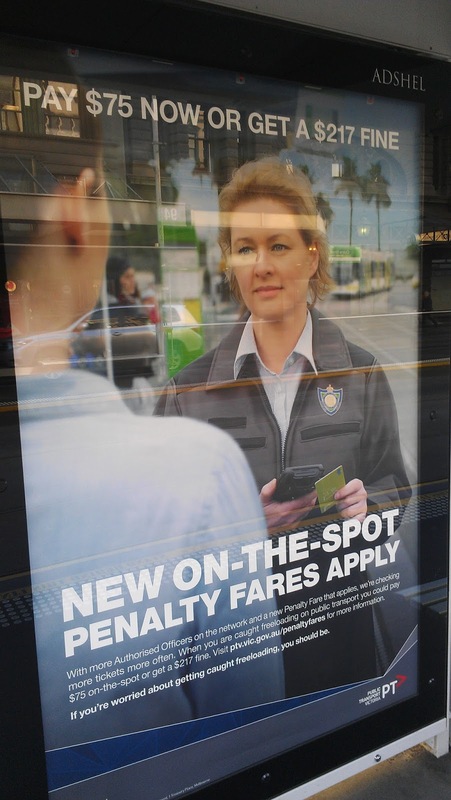 The poster says, if you commit fare evasion, you get a fine. If you are able to pay on the spot, the fine is $75 and if you want to pay it later i, e once you receive the infringement by post to you, it is $217.00. Let me take this Analogy and explain the process of Fare Evasion KARMA. OK, initially there is the seed or BIJA or the point of origin. Bija refers to desire to do a sinful activity - I don’t want to buy a Myki and travel for free. So this thought enters the mind, and its just a matter of time before the act manifests. The person starts enjoying his sinful activity or Papam and nothing happens. This is called Aprarabdha karma, or the not-yet-manifest consequence of a particular activity. Everything we do carries with it a specific karmic reaction, some of which we are currently enjoying or suffering, and others which will come to full fruition at some future date..After few joy rides and fare evasion, sometimes on the very first time, the ticket inspectors catch the person and they issue a ticket. This is Prarabdha karma, or the manifest consequence. This leads to Duhkha, or suffering and lamentation. Oh, why did I not buy a ticket? I might have saved $10 or $15 but, I am paying so much. Duhkha is the cumulative result of karma, the final consequence. These sinful actions are divided into three categories — pātaka, mahā-pātaka and atipātaka — and also into two divisions; prārabdha and aprārabdha. Prārabdha refers to sinful reactions from which one is suffering at the present, and aprārabdha refers to sources of potential suffering. When the seeds (bīja) of sinful reactions have not yet fructified, the reactions are called aprārabdha. These seeds of sinful action are unseen, but they are unlimited, and no one can trace when they were first planted. Because of prārabdha, sinful reactions that have already fructified, one is seen to have taken birth in a low family or to be suffering from other miseries. "My dear Uddhava, devotional service in relationship with me is like a blazing fire that can burn to ashes all the fuel of sinful activities supplied to it. By what is one impelled to sinful acts? When ever, we hear and read of, all the horror stories involving, death, destruction of other human beings, other living entities and the environment, anyone would wonder about this. Well, the same question was asked by Arjuna to Lord Krishna in Bhagavad Gita Chapter 3. Verse 36. Although the living entity sometimes does not want to act in sin, he is still forced to act. The good, bad and the ugly. Some people will even go to the extent of blaming the God saying, if God is all merciful, benevolent why he makes people commit sinful activities.Sinful actions are not, however, impelled by the Supersoul within, but are due to another cause, as the Lord explains in the next verse. Verse 37: The Supreme Personality of Godhead said: It is lust only, Arjuna, which is born of contact with the material mode of passion and later transformed into wrath, and which is the all-devouring sinful enemy of this world. When a living entity comes in contact with the material creation, his eternal love for Krsna is transformed into lust, in association with the mode of passion. Or, in other words, the sense of love of God becomes transformed into lust, as milk in contact with sour tamarind is transformed into yogurt. Then again, when lust is unsatisfied, it turns into wrath; wrath is transformed into illusion, and illusion continues the material existence. Therefore, lust is the greatest enemy of the living entity, and it is lust only which induces the pure living entity to remain entangled in the material world. Wrath is the manifestation of the mode of ignorance; these modes exhibit themselves as wrath and other corollaries. If, therefore, the mode of passion, instead of being degraded into the mode of ignorance, is elevated to the mode of goodness by the prescribed method of living and acting, then one can be saved from the degradation of wrath by spiritual attachment. The Supreme Personality of Godhead expanded Himself into many for His ever-increasing spiritual bliss, and the living entities are parts and parcels of this spiritual bliss. They also have partial independence, but by misuse of their independence, when the service attitude is transformed into the propensity for sense enjoyment, they come under the sway of lust. This material creation is created by the Lord to give facility to the conditioned souls to fulfil these lustful propensities, and when completely baffled by prolonged lustful activities, the living entities begin to inquire about their real position. It is said in the Manu-smrti that lust cannot be satisfied by any amount of sense enjoyment, just as fire is never extinguished by a constant supply of fuel. There is a good dog and a bad dog in everyone. The only way you can kill the bad Dog is by starving it to death by not feeding it. Have a good weekend, everyone. I don’t regularly read news online, but I somehow happened to open the Age site few minutes ago and it’s really distressing. My deep condolences to the Mother and other family members. Faith or Sraddha is the most important qualification and requirement for taking up and discharge of devotional service. In fact, one’s spiritual life actually begins with faith. Unless, one has a little faith in the Holy scriptures like Bhagavad Gita and Srimad Bhagavatham one cannot begin his journey in spiritual life, how much ever knowledgeable and scholar one may be. Actually, faith is required in every sphere and function of a human being. A person needs to have or put faith in so many things, even though they might go wrong or things do not work as planned. For example a person when he buys a flight ticket, he put faith in the Captain of the flight and the co-driver that they will actually, know flying the plane and will take him to the desired destination. Similarly, a person needs to be put faith in family members, relationships, friends, in the company that he works for to pay him the salary etc. Thus, even in the mundane material world and relationships faith is required, for devotional life or Bhakti the role of having faith a must. Sraddha or faith which is favourable to the discharge of devotional service, as explained in Chaitanya Charitamrita, Madhya 22.62, is the conviction that by rendering transcendental loving service to Krishna one automatically performs all subsidiary activities and achieves all perfection. Just like by watering the root of a tree, the whole tree, leaves, branches are nourished and by supplying the food to the stomach all the senses of the body are satisfied, similarly by engaging in devotional service one automatically satisfied all demigods and living entities. The Vedanta Sutra 1.1.12 says, Ananda-mayo bhyasat, by nature every living being is pleasure seeking and our faith is directed to wherever we believe that happiness will be found. The Bhagavad-Gita describes that one develops faith according to the mode of nature one has acquired. The initial faith or Sraddha in Bhakti can come from various ways like, mercy and association of devotees, piety which can act as a catalyst, ajnata sukruti – pious activities beyond one’s knowledge etc. We also heard from Srila Prabhupad, on a personal level about the importance of faith and his experience of faith. He says that the simple secret of his success is because he believed firmly in the words of his guru which is to preach and spread the message of Krishna in the western, English speaking countries. Else where, Srila Prabhupad repeats the words of Lord Chaintanya and his full faith in those words by saying - The potency of spreading Krishna Consciousness is everywhere the same. That was experimented by me in your country, where I came alone without any support; and Krishna is so kind that He has sent me so many boys and girls like you. Lord Chaitanya said that every village and town on the surface of the world will know the message of the Sankirtana movement. This very statement affirms that in every village and town all over the world there are many candidates who are awaiting this message. Similarly, we can see the incident of Hiranyakashipu and Prahlad maharaj. Hiranyakashipu once concluded that Supreme Lord does not exist in the world and tried to convince Prahlad in numerous ways. Because, he searched the entire universe and could not find Vishnu, who killed his brother, he thought that Lord was dead. Prahlad Maharaj, who is a Maha Bhagavatha and had supreme faith in the Supreme Lord could see him every where, even in a pillar. Chaitanya Charitamrita (Madhya 22.64) further confirms that, a faithful devotee is a truly eligible candidate for the loving service of the lord and based on his faith, he is classified as a topmost, an intermediate or an inferior devotee. As one is advancing in spiritual life one’s faith is growing. This section of Bhagavad Gita, explains that there are three classes of Krishna Conscious persons which is determined by the amount of faith they have or achieved. The first class devotee is well versed in devotional literatures and has firm faith in the devotional service, shastra and Krishna. Second class, devotees does not have a advanced understanding of devotional scripture but, have firm faith in devotional service and Lord Krishna. Third classes, even though engaged in devotional service have no faith and cannot reach the highest stage and cannot continue the devotional service for long time and slip away. Thus, faith or Sraddha is very important in performing devotional service or Bhakti. What determines the stage, level or advancement one making in Bhakti depends on faith and one who is not faithful in devotional service cannot attain the Supreme Lord and return to the cycle of birth and death in the material world. Random thought. Suddenly remembered about this guy from long time ago. So, one day he was speeding and got a ticket, then an other and finally, lost all points to drive. His licence is suspended. Then, it was a hot summer day and this guy was standing outside his house. Then, he thought instead of standing, he would sit in his car - of course holding the bottle of Victoria Bitter - a beer that he was drinking. Then, from nowhere the Police came and guess what, a double offence. Trying to drive a car, when the licence is suspended and then at the same time consuming alcohol. This Guy tried his best to convince the Cops that he was not Intending to drive the car and was only sitting in it because, its too warm inside his house. But, to no avail. And, then guess what? He was so annoyed that he wanted the break the laws because, he was fined when he wasn't guilty. So took his car out and within 5 minutes,(I have no idea how it happened) he went and hit a Police car near the traffic signals i, e when he was trying to cross the before the traffic lights turned Red...I never knew what happened to this poor guy. I am not being judgemental and not giving my opinion because, I never knew this guy before and only heard about him from a friend. What do you think is the reason for the mess he was in..Well, it could be due to his bad luck (which is due to his bad karma) or simply being negligent, careless and taking things for granted? It is said that, two factors influence the outcome of all acts: endeavour and destiny. Without both there is no success. A man who does not work but who depends on destiny alone will be ruined. Rabbits does not line up the tigers mouth - A minimum endeavour has to be there. Sometimes, however, despite one’s best endeavour, destiny delivers only adverse results. Why ? Because, with your previous actions you have accumulated this karma. If everything is pre-destined, then why work? Law of Karma is coming perfectly, everything will be accordingly, finished. Then why work? Actually, we have created our own destiny according to what we have sown; accordingly, we are going to get results. Even then, the choice is yours as to what you want to do. Because of your karma, right in front of you, you have got a glass of milk and a glass of liquor. This was your karma and you got, now the choice is up to you. You want to drink this or you want to drink this. But once you put it in your month, then you have to wait for the reaction. But before you do the action, the choice is always there. The Lord never takes away the independence of choice. In Bhagavad Gita 4.17, Lord Krishna tells Arjuna this - "The intricacies of action are very hard to understand.Therefore one should know properly what action is, what forbidden action is, and what inaction is." There is an incidence from Shastra, once Dhritrashtra asked Krishna, Krishna why am I suffering? First of all, I was born blind; I did not get my kingdom and right in front of me, all my hundred sons perished. Krishna told Dhritrashtra, my dear Dhritrashtra, fifty life times ago, you were born as a son of a hunter. One day you climbed up a tree and with a pointed stick you blinded the father bird in the eyes and then you set fire to the nest where hundred siblings of the bird were there and they were all roasted alive. Therefore, this lifetime you are born blind and right in front of your eyes, your sons have been killed. Dhritrashtra asked a question, Krishna, but why fifty lifetimes. You could have given me punishment then and there and got finished-off my account. Why did you wait fifty life times to do that? Then Krishna explained, He said, my dear Dhritrashtra, to get one son, you have to do so many good Karmas. This is the concept of delayed Karma. Therefore, it is very important to know the laws of Karma and live a pure and simple life; otherwise, we are getting ourselves entangled.